It is Disneyland's policy to provide a list of all ingredients at each restaurant or stand. Over in New Orlean's Square at the Royal Steet Veranda (near Pirates of the Carribean), they offer what they call a "vegetarian gumbo." The cashier said it was vegan. I'm not sure if everything about it was vegan, but I didn't detect any dairy, fish, eggs, or meat on the ingredient list. 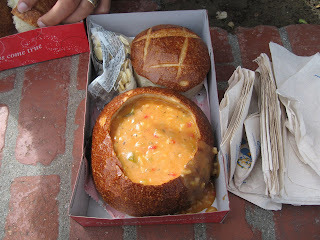 This included the crackers and the sourdough breadbowl that came with it. And it was very good. I think it might be the healthiest meal you can get there. Who knew a theme park would have something for vegetarians.